As those of you who have got to know Jane and myself (Becca) well will testify, not only do we like a challenge we also like to share! As you may have read in my last post, I haven’t ridden a bike since I was 11 years old. I have been out on my husband’s bike and am soon going to be the proud owner of one that fits me(husband was thrilled that buying my birthday present was so easy), so that’s all my excuses for completing a cycling #Whalleyphysio15 challenge gone. The Preston Guild Wheel is a 21 mile Greenway that encircles the city of Preston, linking the city to the countryside. The route is mainly off-road and traffic free, providing a scenic and safe cycling route so Jane tells us! In the spirit of our caring sharing practice and because we want to challenge everyone to do something healthy that is out of their comfort zone we have “suggested” to a few of our staff and patients that they might like to join us…. So far we have 13 (I’m not sure you’d call them willing) participants who are all novice cyclists or who haven’t been on a bike for a long time due to injury that are going to give it a go at the end of June. What are you going to do to improve your health this year? Talk to us about it and we’ll give advice, tailored exercises to your complaint and challenge and most importantly lots of support and encouragement. Another of our fantastic clients has embraced our year of challenges and Marty will be completing the Blackpool Race for Life 5km race on 1st July. Marty has suffered for years with a bad back and consequently poor fitness so together we are getting her fit and raising money to take on the challenge to fight cancer. Have you met Harry yet? 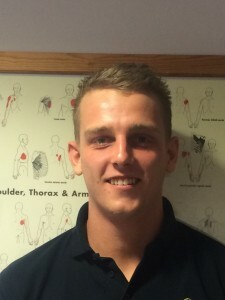 Harry Reddick has joined us at Whalley Physio to take on the challenges of Wednesday and Friday nights. Harry, like all of our Physiotherapists is chartered and has lots of varied experience. He brings with him bags of enthusiasm and has already accepted and completed the first of his #whalleyphysio15 challenges.